Chronic venous insufficiency (CVI) is the most common cause of leg ulcers. A venous leg ulcer may appear in the later stages of CVI, near the ankle where large veins exist. They are described as shallow, open sores (varying in size) that are relatively painless. Venous leg ulcers are the aftermath of pressure buildup in the lower extremities from blood pooling related to chronic venous insufficiency. This pressure incites the lymphatic system to produce fluid, which creates swelling and leakage into surrounding tissue. As a result, circulation in the lower legs diminishes. The blood that does reach the area is low in oxygen and high in lactic acid and other end-metabolites, which creates a low-nutrient environment. Without essential nutrients normally delivered through oxygenated blood, the legs are hampered in their ability to heal. Women over the age of 50 have the highest risk for developing CVI and related symptoms. Individuals with varicose veins (bulging veins that appear on the legs and feet), or a history of venous thrombosis (blood clots) are at an increased risk for developing venous leg ulcers as a symptom of CVI. Obesity, high blood pressure and a sedentary lifestyle are also risk factors for CVI. Chronic venous insufficiency tends to affect individuals who spend most of their time on their feet, such as EMS workers, retailers or food service employees. As with all symptoms related to CVI, the disease itself must be treated to alleviate ulcers. 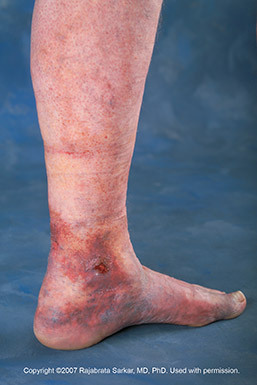 Venous leg ulcers are difficult to heal, and conservative therapies may include compression stockings or multi-component bandaging, elevation, and topical wound medication. Several, minimally invasive procedures are available for the care and treatment of chronic venous insufficiency, including endovenous radiofrequency ablation (RFA), ambulatory phlebectomy, and ultrasound guided sclerotherapy. If you have leg ulcers and believe they may be related to CVI, schedule a consultation today to learn more about the treatments available to you.